Cream wool suit jacket covered in white vermicelli beading, with faux pearl covered lapel and an armband in square black Swarovski crystals. Worn by Michael Jackson when he attended the Academy Awards with Madonna in 1991. A custom created black suit jacket with single snap front closure lined in colorful African style fabric and covered in custom vermicelli beading. Michael wore this jacket during his 1997 primetime interview with Barbara Walters. Custom red wool "Sgt. Pepper" military style costume jacket. Made by Bill Whitten, and is likely an early version of the more elaborate beaded sequin jacket worn by Michael to the 1984 American Music Awards, also designed by Whitten. Red wool blend jacket with red lamé lining and completely covered in red bugle beads with an elaborate gold seed beaded rope design with matching cuffs and epaulets. Black jacket made of suede with silver printed striping and plastic starbursts that light up. Michael wore this jacket during his 1987 BAD tour in Japan. Black leather jacket with metal buckles designed by Michael Bush and Dennis Tompkins. Michael wore this jacket for a photoshoot during his 1987 visit to Japan. Black synthetic blend jacket worn by Michael during the song "BAD" on the BAD Tour, and is signed on the back in silver marker "Love Michael Jackson 1998" with three 0's over an arrow design. Red snakeskin leather jacket with silver studs, black zippers and crystals at both shoulders designed by Dennis Tompkins and Michael Bush. Michael wore this jacket on stage during the BAD Tour 1988-89 performance of Beat It. Black trench style coat worn by Michael Jackson over his red Beat It jacket on a cherry picker during the 1988-1989 BAD Tour. Red leather jacket with black leather detailing and battery-powered illumination panels throughout, worn by Michael Jackson during the performance of "Thriller" on the 1987 leg of the BAD Tour in Asia. Custom made black and gold short jacket for Michael to be used during his "Beat It" performance. Designed by Andre Van Pier. Red vinyl style zippered short jacket owned and worn by Michael and designed by Andre Van Pier. According to "Gotta Have It", this jacket was to be worn by Michael in concert during the performance of the song "Beat It." A red leather J. Palo Michael Jackson Beat It style jacket. Signed by Michael on the right chest. Custom made pink satin jacket made for Michael in the 1990's. According to "Gotta Have It", this was to be used during "Beat It". Unique 'Beat It' leather jacket worn by Michael during the video shot. It comes with his personal letter. Black crop jacket with white textured floral pattern. There is a handwritten label reading "HAV0009 M.J.J." and a Western Costume label reading "Michael Jackson". Probably from the 1990's. Black double breasted jacket with a red arm band and a patch on the left chest. Designed by Dennis Tompkins and Michael Bush. Probably from the 1990's. Black leather jacket with front zip designed by Dennis Tompkins and Michael Bush. 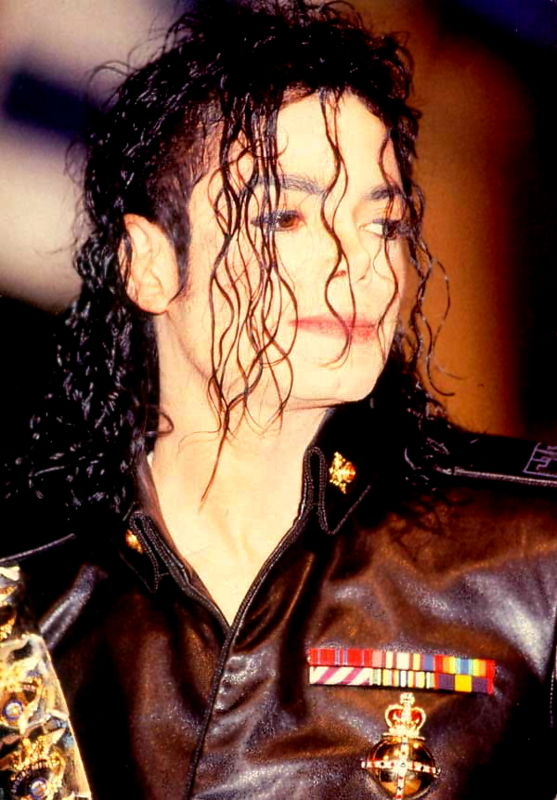 Probably Dangerous era. Black leather front-zip jacket embellished across the front and back with miniature utensils. A red leather sash is tied around the right upper sleeve. Designed by Dennis Tompkins and Michael Bush.